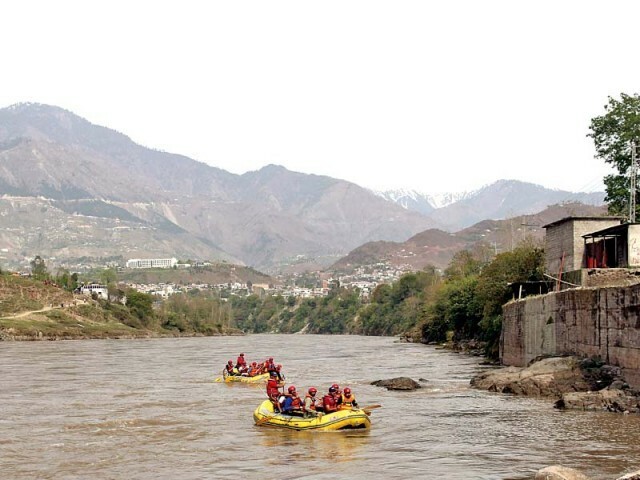 MUZAFFARABAD: Around two dozen adventure seekers thronged to the mighty Jhelum River in Azad Jammu and Kashmir (AJK) on Friday to catch a glimpse of the possibly the first ever white water rafting event in the valley. 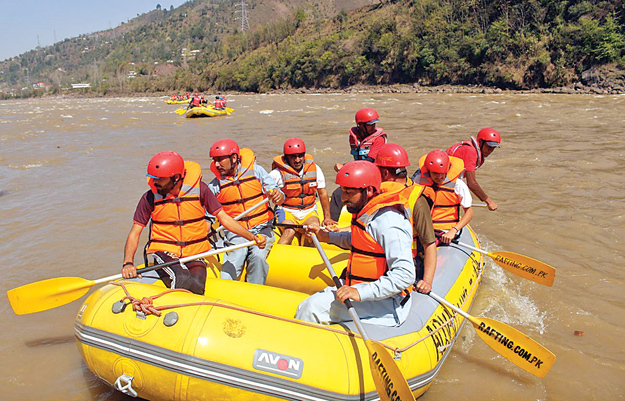 As many as 24 rafters riding in four boats braved the rapids and negotiated strong currents in the Jhelum River over a 20-kilometre stretch from Ghari Dupatta to Muzaffarabad. The rare sight of people wearing bright orange helmets and life jackets in yellow boats also attracted a large crowd of spectators on the banks of the river. They encouraged, applauded and shouted as the rafters appeared to disappear into the rapids before emerging from the spray of waters along the flow of the river. 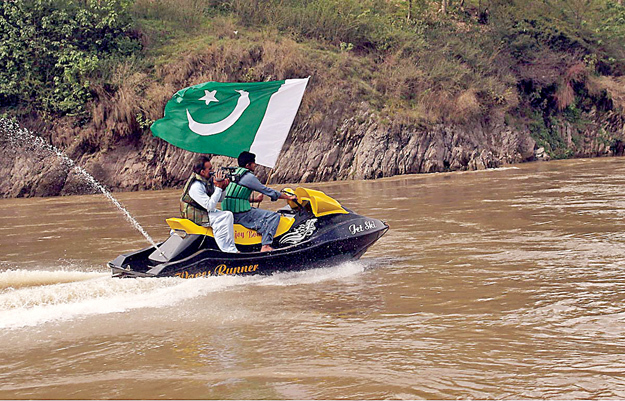 “This is the first time in my life that I have seen someone boating in such a rough river and it was really enjoyable to watch,” said Rehan Ahmad, a tourist. Another tourist who was visiting from Islamabad along with his family and was watching the rafters remarked that the sport looked like a lot of fun. He added that there was a need to enjoy the beauty of adventure tourism in this way. The rafters, who came from the different parts of Pakistan, said that rafting in the Jehlum River was an experience and that the AJK government should promote this water sport to attract more tourists in the region. “I rafted first time in Azad Jammu and Kashmir which is a better experience and I want to continue riding in the Jhelum and Neelum rivers in the future to enjoy this sport,” said rafter Khalid. Nisar Rathore, another rafter participating in the event, said that water rafting requires high water levels which are usually available from the middle of June to August. But both the Neelum and Jhelum rivers were ideal for white-water rafting the year round. “People lining up on the banks of the Jehlum River and Srinagar road were the real source of encouragement for the teams,” Rathore said adding that at least six people were riding each boat. “Clapping by spectators motivated us to play with the currents of the mighty river and we enjoyed the maiden experience a lot,” he further said while voicing his support for promoting the sport in the region. Asked whether the sport was safe with boats going over sharp rocks lodged in the river bed, he explained that the boats they use were strong hulls with dual linings. Earlier, the group of thrill-seekers was seen off by Tourism Secretary Mansoor Qadir Dar and other officials from Ghari Dupatta. Dar said that with spring nearly upon them, water levels in the rivers had increased, much to the joy of those wishing to partake in water sports in the valley. “Rivers Jhelum and Neelum are ideal water bodies for white water rafting and all available resources are being used to promote this full-of-adventure sport ahead of summer,” Dar added. Later, the secretary distributed shields amongst the riders and appreciated their skills. Published in The Express Tribune, March 26th, 2017.